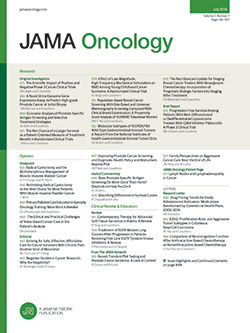 Mutation in BRAF V600E: A Poor Prognostic Marker in Stage III Colon Cancers With Deficient MMR? To the Editor Based on 2 oxaliplatin-based adjuvant trials, Sinicrope and colleagues1 recently reported an association between survival after recurrence (SAR) and both DNA mismatch repair (MMR) status and BRAF mutation in patients with stage III colon carcinomas (CC). Given that MMR status and BRAF mutation are strongly associated, they analyzed MMR and BRAF as a combined variable. Among dMMR CC, BRAF-mutated tumors had significantly poorer SAR compared with BRAF wild-type tumors (adjusted hazard ratio [HR], 2.70; 95% CI, 1.23-5.93; P = .01). Some caution is warranted when analyzing these results. When using SAR as an end point, patient treatment at recurrence has an effect on survival but these data were not available. Also, patient numbers were relatively small in the different groups resulting in low statistical power: 33 BRAF-mutated dMMR and 40 BRAF wild-type dMMR. Adjusted median SAR were incalculable owing to small sample size and lack of robustness of the model. In addition, results were adjusted on variables collected at CC diagnosis and not at relapse (ie, performance score), which is not relevant.